Members of the IAM District 9 Community Service and Human Rights Committee were the talk of the town at a recent outreach event, the “Working Women’s Survival Show,” outside St. Louis. Crowds flanked to the table – including an unexpected flash mob of Rosie the Riveters, which drew even more attention to the Machinists booth. Members of the IAM District 9 Community Service and Human Rights Committee were the talk of the town at a recent outreach event for women in St. Louis. 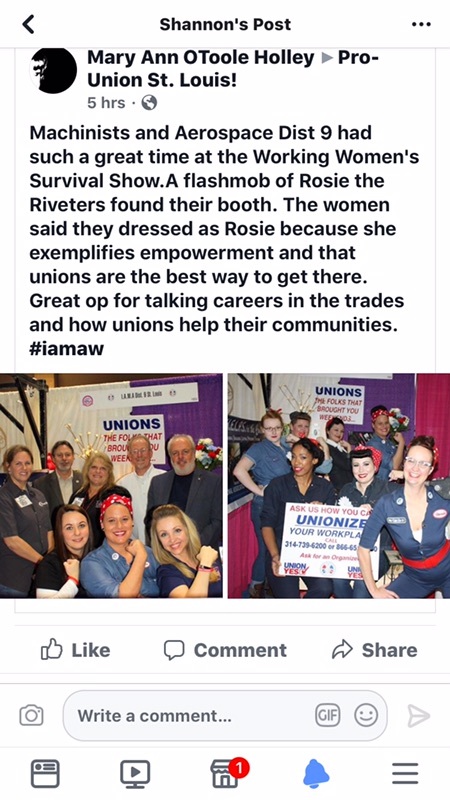 They were among more than 400 exhibitors featured at the “Working Women’s Survival Show” at the St. Charles Convention Center – and their booth could only best be described as a huge hit. Though initially told by event coordinators that they could not participate because they were a “political organization,” Community Service and Human Rights Committee Chairman Scott Hargis worked with Local 660 members Michelle Windmiller, Community Service Recording-Secretary Jennifer Kahl, and Shannon Anderson; Local 777 members Amy Wokovich and Bethany Alexander; and Peggy Flinn and Dacia Strattered of District/Local 837 to ensure a place for a Machinists Union booth at the expo’s female-tailored event. community, and the power of union women. 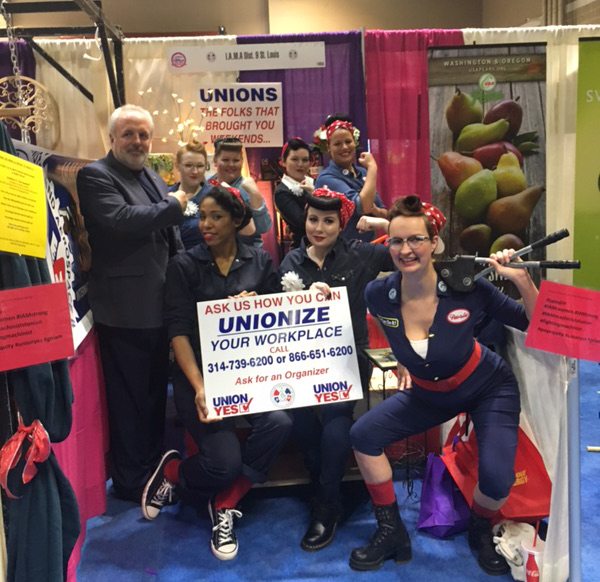 Crowds flanked to the table – including an unexpected flash mob of Rosie the Riveters, a club of women known as the Decade Dames who meet monthly and dress in themes, which drew even more attention to the Machinists booth. “Others came to the booth to thank a union, to remember how union benefits kept their families strong and how their father couldn’t have survived without his union pension,” wrote the Labor Tribune. Hargis said organizers estimated nearly 40,000 people were in attendance over the two-and-a-half day event. 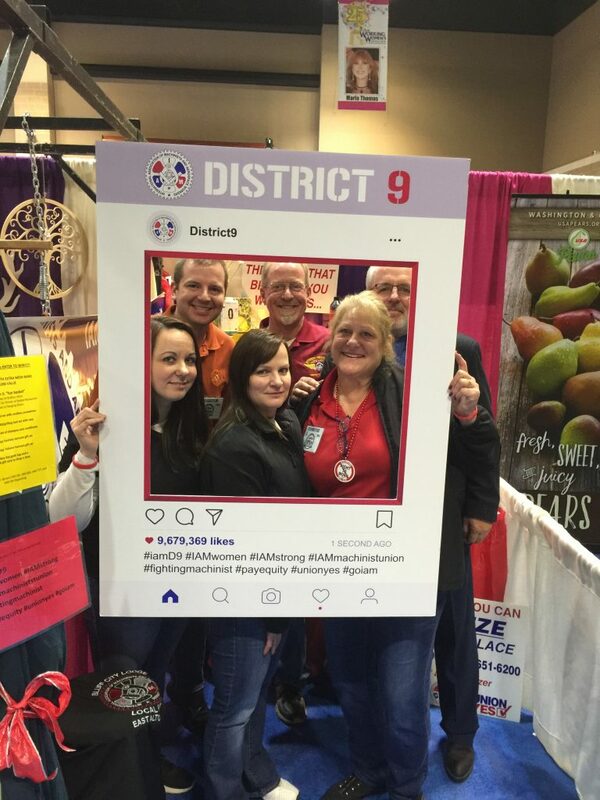 Visitors to the Machinists booth were also invited to take a selfie in costume and post it on District 9’s Facebook and Twitter pages. District 9 Directing Business Representative Mark Conner said he was overwhelmed with the success of the booth at a show not typically considered union-friendly. “We are definitely going to do more things out in the general population, rather than always preaching to the choir,” said Conner. “Our Community Service Committee members have been doing an outstanding job of energizing the various diverse groups within and outside our union.